I’m committing to a bedtime of 10:00 so I can be up at 6 (though I would like this to be 5:30 so I can get a workout and Bible reading in before I have to get my oldest up for school). I know that’s not 8 hours but I can’t seem to get to bed any earlier! I feel like I have so many things I would like to do in the am before the kids get up (like some blogging added to the above list) but then I would be up way to early and going to bed at 8! Anyway, by 5 evening tasks will be kitchen cleaned up, lunches packed, breakfast set out, 15 minute clean up, to do list made. Looking forward to the rest of the series. This is definitely an area I need help in. Phew, okay- 9 pm! We can do this! lol. I do most of this already, but if there are no leftovers to eat for lunch, I usually do not make lunch the night before, and I usually do not lay out my clothes the night before. I’m looking forward to trying these out! This is perfect for the beginning of a new school year!!! oops, I forgot my list of five things (see what missing the Big Bang Theory does to me?!?)! 2. Make my To-Do list for tomorrow. 3. Set table for breakfast (We have even used a little pitcher of milk in the door of the fridge, and when the kids are ready to eat breakfast they don’t have to wait for an adult to pour the milk!). 4. Make sure all the backpacks, purses, diaper bags, etc. are packed and ready for the next days’ activities. 5. Prep for tomorrow’s school lunch packing – whether it’s packed ahead of time or laid out ready to pack quickly. Love the idea for the little pitcher of milk. Stealing that! Amen to the coffee ready to go! I did this every-single-night when work demanded very early rising. My bedtime will now be 10pm! My goals for every evening are to have clothes laid out for the next day, clean and prep kitchen (meaning have breakfast ready for the next morning), KEYS BY THE FRONT DOOR!!! (this is a big issue in my household…always losing the keys), lunches ready to go, and last but not least make sure the kids rooms are picked up! Do you have a key hook by the door? My hubby and I are constantly switching cars, depending on his commute that day, so they key hook is a life saver! Keys always go there, no exceptions! I’ve had the same hook by the door for 10 years, and I’m still begging my husband to use it! You’d think after 10 years of not being able to find his keys . . .
We did the key hook thing for a while….but…my husband also refused to use it! I guess not so much refused but just decided not to. I don’t know howmany times we’ve had to hunt keys down in the morning. He has finally found a resting spot for the keys. Now that we have moved we hve a fireplace and mantle and he puts the keys on the matle. It is just my job tomake sure that they are there at night! I thought you were advised NOT to keep keys by the door, as they would be easy for a thief to find? Here most front doors have a letter box and it is possible for someone to open the flap, stick a hook through and “fish” for keys in a bowl or on a hook near the door. Then they just let themselves in. Even if you don’t have a letter box a window or something might do the same. I have a bowl for keys in the living room, which is the nearest room to the front door. And also where I sort post and keep things like appointment letters. Whenever I find the keys somewhere else I put them back in the bowl and it is becoming a habit, now throws me completely if they aren’t in the bowl! 1. Bedtime is 11! Get ready for bed at 10:45. 2. All toys picked up and put away. 3. To Do list for next day written. 4. Hubby’s lunch and iced coffee (minus the ice, he can do that himself at 5:30am!!!) made up and in the fridge. 5. Hubby’s work clothes ironed and set out for him. Bed time is 10:00pm., so I need to start these things at 9:30pm. Thank you for this challenge! I am looking forward to seeing the changes in my day! You mean I’m not the only one who has to FIND all the sippy cups before I can do the wash? Looking forward to the rest of the challenge! Maybe I should lump shower/hair and add a new #5 – make sure all bookbags/diaper bags are ready to go for the morning! I’m starting with a bedtime of 11, so I can have time in the evening with my night owl hubby. My 5 things are: layout clothes, spend 15 minutes picking up the main rooms, plan and do any prep work for breakfast, get backpacks and lunches packed, check my calendar. Ok, I’m great on 7 hours of sleep, so no later than midnight bedtime (this is hard, don’t laugh)… Would like to get up around 7:30am (with alarm at 7, giving me plenty of denial time). With dinner around 8pm, and bedtime routines for kids, and cleaning routine for mommy, gives me and my hubby a couple hours still to just be us. I usually do most of these things, but checking them off will make it more concrete. Love lists. Bed by midnight is hard for me too 🙂 most days its 1 or 130 before I get to bed. I am shooting for 11 with a 6 am wake up (I function best with 7 hours). No dishwasher either, we are moving soon and I told my husband our next house will have a dishwasher or we are not living there! I thought I was the only person alive without a dishwasher! We haven’t had one in so long, not sure if I would know how to use one. LOL! I already thought about this last night, only because it has been bothering me. But the thing I want to change/get back to is making sure the kitchen is clean at night! That just helps my mental state in the mornings. Definitely going to have to go to bed earlier too! Oh, yes, we CAN do this! I’m committing to a bedtime of 10:30 to be up by 6:30 or earlier. This would give me about two hours to have a quiet time, quick morning workout, and get ready so I can be into work by 9:15. 5. Purse/things for work ready to go. My bedtime will be 11pm. It’s funny how once I decided to participate in this chall-onge yesterday, I started to try to prethink what you’d suggest as helpful tips…and hit this one on the head. It was already refreshing this morning to know that I’d gotten my 5 things done….but I still didn’t get in bed on time. Yikes! We’ll see if I can stick to these…..it’s looking a little sketchy! Tomorrow, I’ll share my bedtime and Top 5 Evening Must-Do’s and will check in daily here at noon to tell you how it’s going for me and to see how you’re doing in sticking with it, too. I need to be in bed by 10pm each evening…which might be hard because I have an 8 month old that is a night owl, but I’m hoping that changing my schedule will change hers as well. My evening routine will consist of cleaning the kitchen, picking up and vacuuming the living room, making lunches for the next day, to-do list for the next day, and Bible reading. 10 pm! Clean up kitchen, quick pick up, lay out clothes for tomorrow and make my to do list for tomorrow! I’ve actually been doing this part for a week or so now and it really does make a huge difference!! 2) clean kitchen and coffeemaker set 3) plug in all electronics so I don’t start the day with a dead laptop or phone 4) prepare one blog post for the next day 5)check Outlook for the next days agenda. I must say, I’m encouraged by simply reading other posts. It’s kind of like we’re all workout partners eggin’ each other on. Thanks for the outlet to literally “clean house”! …in addition, I can ask my husband to do one of these 5 tasks which could give me time to do something else for the next day! Have the next day’s to do list made. Next day’s dinner figured out. Check animals food and water. 1. Set clothes and workout clothes out. 2. To do list made for the next day. 3. Quick pick up of the house. 4. Get anything ready for whatever I want to use in the morning. For example, iPhone and ear buds, a book I want to read, stuff for a project I am working on, etc. 5. Bags packed for the next day. e. The girl’s school stuff ready for her to head out the door. 1. Check schedule and set out needed items to take the next day. 2. Pick out clothes for the next day. 3. Wash any dirty dishes. 4. 15 minute house clean-up. 5. Clean out catbox and give cat his medicine. My bedtime will be 10pm. Just #3 alone will save me so much time…I can even get a cup of milk ready to go too, so when I hear him wake I can grab it and go get him out of his crib and dressed all in a matter of minutes! My bed time is 9:30. I need to be up by 6 to be out the door by 7 and I figure to go for 8 1/2 hours sleep. If I’m done early I’ll get an extra 30 minutes and if something comes up then 10pm is just as good. I’ve committed to a bedtime of 10pm and my 5 must dos are setting clothes out, a clean kitchen, a quick clean up, bags and backpacks set to go and a to-do list (mainly planning dinners and night time routines). Okay, I am going to shoot for a bedtime of 10 p.m. I always read my Bible at night (started the habit on January 1st). I need to be up by 6 a.m. to get ready before I wake up my daughter at 6:30 a.m.
5. Perhaps lay out my clothes for the next day. Just as a little tip for other readers, I set out my daughter’s clothes for the week (hanging in her closet). She has to wear uniforms which makes it a lot easier. But then I don’t have to set the clothes out the night before. It just makes it so much smoother in the mornings having that one little thing already done. Yes, this is where the trouble starts. Getting to bed at a decent hour. What happens is I stay up too late then I go to get up to go to bed, and decide I can’t leave the dishes in the sink, I need to take out the garbage, and if I just mop the floor I won’t have to do it when I wake up… then I go to bed really late. Yes new routine desperately needed. Also getting enough sleep is so good for your health too. Before bed, I will lay out my clothes, pack my bags for work and the gym tomorrow, pack lunches, clean up the house, and read my bible. My situation is different than most reading this blog in that I am 21, single, have no kids, live with my parents and work night shift. My morning would be most people’s evenings. I leave for work at 10:10 at night, and return home around 8. I’m doing pretty well to fall asleep by 9 a.m. In a perfect world, I sleep until 4 or 5, and wake up and have the whole evening to do what I please. However, I often sleep until noon or 1 p.m. and then take an evening nap. A couple things I always do of an evening are take a shower, and pack my lunch for the day. Those things can happen anywhere from 5-10 p.m. depending on when I wake up. If I were doing more of the household chores, I would use my afternoon or evening, whenever I woke up, to cook, clean, etc. But since I have the freedom and ability to, it seems like I spend most of my time napping to try to catch up on sleep. The other day, on a day off, I slept from about midnight to 7 or 8 a.m. and felt wonderful. I thought, “This is what I’m missing out on!” The body is made to sleep best at night, but some of us have jobs where being up all night is required. I’m a new nurse and really enjoy night shift. But it does seem to cut down on the extras a person can realistically fit into their life. Then again I have always really valued my down time and try to keep life simple. I also have really missed being able to be a part of my small group with girls at church. It’s just a whole different world, working nights! I’d love to hear how other people do it! I am a police dispatcher ( part time now that I have the kiddos) and I worked night shift for years. It is it’s own world and often I know sleep is all you want to do. My best advice is to try to keep to a schedule as best you can .. I don’t know if you have a gym or if you run but I found that staying active made a big difference in how I felt with that wacky sleep schedule. If your church group meets at a time that won’t work for you due to sleeptime – check to see if you have a CBS (community bible study) program in your area. They have classes that meet all different days of the week and both morning and evening studies. That might be a good way for you to stay plugged in. I’m not part of a girls group either (there aren’t many people my age in our church) so its nice to be part of online communities that offer encouragement! I enjoyed hearing how you “make it work” for you, keep it up! My aim is bedtime by 10 pm. My husband typically works 4pm-2am, so I’m really tempted to stay up late but I’ve gotta get that taken care of! My 5 Evening Must-Dos: 1) lunch preparation, 2) find a place for 5 things, 3) do the day’s dishes, 4) read 15 minutes, and 5) make tomorrow’s to-do list. Here’s a great site for slow cooker breakfasts! 10:00pm. for me. I get up at 6pm, just to get things done before my busy little 18mo wakes. I’ll start with this…we will see. My bedtime will be at 9…that seems so early, but I’m sure it will make a difference in how I feel during the day. I will start my bedtime routine at 7:45. 2 hours 2o minutes total. So start by 9pm and any extra time gets thrown into #5! Sounds easy enough! 1. Table cleared off in prep for breakfast. 2. Dishes out of the sink/run dishwasher. 4. Papers signed and backpacks ready on their hooks by the door. 5. To-Do list written out for the next day. People are listing laying clothes out for the next day. We actually plan for a week at a time with each of the kids having a days of the week organizer in their closet or you can just get a hanging sweater holder. (I found our two at a thrift store and a consignment sale. This helps so much because as I do laundry, I just put outfits in the organizer instead of hang up or put in drawers. I usually double check on Sunday nights with a check of the week’s weather on the computer and make tweaks as needed. This also gives the kids a sense of independence because they don’t have to ask about what to wear. They just wake up and get dressed. Hope this also helps. I love this idea !! We have school uniforms but there is so much flexibility in what they can wear that it still seems to be such a chore to pick out what to wear .. and my 3 year old is all about picking out her own things which always leads to a battle. thank you so much for sharing ! I always go to bed after 11:30( usually after 12) and get up at 6:45 or 7 to be out the door by 7:40 with my three kids. I am not sure how to get everything done after I get home at 5:00 if I go to bed any ealier, especially when we have evening activities. I would like to make my children more responsible to hopefully give me some more time to scrapbook or read. Hoepfully I can get a routine set up once the school year starts and we are back on that schedule as both my husband and I teach and all three of your childen will be in school all day this year. Yay I’m not alone! I totally felt weird putting midnight as my “goal”… Lol We got married young, then had kids young, and we still act young together in the tiny space of time between kids bedtime and ours. We both do hobbies, watch silly shows and eat ice cream (bad nightly habit… Not ready to end that), and stay up talking by accident. We’ll probably always go to bed no earlier than midnight. At least as long as I’m a stay-at-home mommy- it’ll be kids up and going at 9am. Our schedule is shifted later in the day mostly so we can eat together when daddy gets off work and he has time to be with the kids a little while. Thankful we can do that. I like the later nights and later mornings for our family, too. My bedtime goal is 10:30pm. 5. Spend quality time with my husband! this is the #1 area I struggle in .. I have so many big plans but then go to bed WAY too late and sleep til one of my kids wake up. No wonder I am in such a bad mood in the mornings right?? Ok .. here we go. I would like to be up at 6am in order to do my bible reading and get dressed/ready before I have to think about getting the kids up. So, that means I need to be in bed by 10-10:30. I’m aiming for a 10:00 bedtime. I know for a fact that having these things done makes the morning (and really the entire next day) go so much more smoothly. One of my least favorite things to wake up to is a counter full of dirty dishes…ugh. Wake up by 6:30 a.m. I was already mulling this topic around in my head and checked in on my Reader and voila! You have a series started for me… I mean US. 🙂 HeHe! I am committing to a bedtime of 10. I’m shooting for being in bed sooner than that, but lights out by 10. Up by 6 AM, ready for walking and devotions. Thank you for doing this series! I need it to get back on track for the upcoming school year! I need to be up at 4:45 am, but bed time of 8:45pm is just not doable. Monday & Wednesday I don’t get home from my second job until 845. So I’m aiming for 9:30 regularly (with option of 10 on M&W). Heather, I’m glad I’m not the only one! Every post I was reading allowed for the 8+ hours recommended, but I have to get up at 5, and I have a two year old and a five month old to tend to in the evenings! By the time I get home from work at 6 pm, cook, eat, and do baths, I would like to have time to give my kids a hug and not just do housework! I’m aiming for a 10 pm bedtime and get up at 5. Good luck! I need to be in bed by 9:45 and my 5 things to do before then is to do a quick “pick up” of the house, lay out clothes for next day, have breakfast/vitamins laid out, purse/bags packed and ready by the door, and schedule looked over for next day. Bedtime – Lights out by 10:30. Probably need to move it up to 10:00 next week when school starts, but we will ease into that. 3. Have my husband’s lunch items together in the fridge and packed up. 5. Have breakfast items out for the am (including filling kids sippy cups). Hm. Some of this I knew – but realistically, for me this means starting on “must-dos” either before the kids go to bed or right after, and as soon as the must-do’s are done, get ready for bed. Kid’s bedtime has been moving later and later (not my choice), and so they’re not usually both down until 8:30 or even 9, and I’d like to be in bed before 10pm. Just doing the dinner dishes takes me 30-45 minutes… Obviously, something is going to have to change here. #5: Read Bible or devotional and pray. Bedtime 9:30 pm. Strictly, I have a DVR, I should use it and stop trying to catch up at the end of the day! 5. Have my plan laid out and ready for the day, without some flexibility for life’s little surprises. 4-15 quick clean in other areas. I am committing to my bedtime of 10 so I can be up by 6. 1. Lay out outfit and make sure it is ironed. 4. Have everything I need to complete the days errands by my purse. Realistic bedtime for me will be 10:30 since we’re still on summer break for the next 3 weeks! But would like to move it to 10 PM when school starts on Sept. 5th. 5) Get ready for bed! (in pjs, brush teeth, etc.) I tend to get distracted!! This series is such a blessing. This is the perfect first assignment and I’m going to do this with my family tonight. Thank you so much! I love this post! I began an evening routine in college – making sure my books and notebooks were in my bag before I went to bed. Now that I’m married, working, and have a 7 month old I have a few more things to do at night, but making sure things are ready to go at night makes our mornings that much smoother! Each night I make sure my lunch is packed, my son’s bottles and food is ready to go in the fridge, pack his backpack and pack my things for work. Our mornings run smoothly even though things are a little bit chaotic because we have things ready to go the night before. Thanks for more suggestions! I’m probably going to seem insane to some of you, as my wake-up time is 4:45am (eek). My husband has to be out the door by 5:30 for his hour and a half commute (one way) to his current job-site, and I will have to drop both children at school/sitter by 7am in order to get to the school I work at (in a different county) by 7:30am. This includes getting a 4 year old and 4 month old dressed and fed….one of which MUST have a bottle! I like to get there early so that I can things done before school starts and leave at a decent time in the afternoon after faculty meetings/parent meetings/etc. So….my bed time will be no later than 10pm…won’t give me as many sleeping hours, but I will tweak this over the 3 weeks. 2. Bottles for Baby J washed, prepared, and labeled in fridge. 4. My car keys on the hook….I lose my keys too easily! 5. Extras for lunch boxes (veggies, fruit, chips, etc) bagged and ready to be put in the bag. Kimberly – Not crazy! I just moved this weekend so that I wouldn’t have that 1 1/2 hour commute each way anymore! I did it for a long time, but I’m so relieved to be a little closer to work now! I remember those days! My husband is also gone very early for a long commutes so it used to be up to me to get the 4 month old and the 2 yr old and myself out the door every morning for daycare drop off and off to the office. Everyone dressed, fed, lunches packed, me in office attire, packed gym clothes, and dinner prepped for that night when I got home. Life felt like a giant treadmill! You may do this, but when I would go in to get the baby (as he gets a bit older) I would just have his bottle ready and hand it to him while I changed his diaper and clothes. He would drink at the same time. I also switched to a leave in conditioner in the am. That net me 10 WHOLE minutes! lol! Bed by half nine…. Coffee ready to go in coffee maker, clothes laid out, kitchen straightened up with sink empty, lunches packed, and backpacks by the door! Do a 10 minute quick house clean. Let dogs out for bathroom break. 1. Kitchen picked-up/ dishwasher started, if haven’t already/phone on charger. 2. Backpacks and lunches packed and ready to go. bed time is 11pm up at 6am so I can have a workout and shower before the baby is up! My bedtime is 10pm and my kids bedtime is 8pm. We will need to be up at 6am starting next Wednesday so we might as well start now to avoid the crabbies. I’m allowing for an hour and a half so I am free to hang out and talk with my husband while doing these things. … So I need to start at 9pm. Any extra time before bed will be spent RELAXING! Ok- I really need this because I find myself being short with my children and I know it is because I am going to bed very late and not getting enough sleep. My bedtime will be 10:00pm so I can get up at 6am- 30 minutes prior to my children(once school starts). Uggh…if I get up at 5:00 to workout, then I would need to be in bed by 8:30/9. That is not going to happen seeing the kids go to bed at 8:00 during the summer! I will shoot for 9:30 on the morning I get up to workout and 10:30 on the days I don’t need to get up to workout (on an every other day schedule working out in the mornings since Hubby and I trade off watching the monitor). My bedtime to start will be between 11pm and midnight (may seem really late, but I’ve been averaging 1am lately). Now that my little one isn’t napping, my laundry routine has gotten out of whack. I’m hoping by having the machine start automatically and switching it over during Morning craft, will help get that ball rolling more regularly. I’ve been what feels like a shut-in, since we moved into our home 3 years ago. Only going out for doctor appointments when I had our one vehicle. My oldest starts school in September and the few times we’ve run out during the day, the whole rest has been so lopsided, forgetful, disorganized. I’m really hoping this will help get us a working routine so I’m not falling behind on meals, cleaning or even FUN with the kids. Thanks so much Crystal for these motivating challenges!! 1. My bedtime is going to 11 pm. I would love to go to bed earlier but by the time I get kids around I get a second wind and need some non kid time. 2. I picked 6 must dos cause 1 is pretty much a given. 5. To do list for next day so i know what i need to do. Ok, I can do this! My bed time is 11pm, so that I can be up by 7am. I usually go to bed and do some blog reading, but I’ll have that finished up before 11. 2. With school starting next week, have kids lunches packed. 3. Have my husband’s lunch packed. 4. Make sure breakfast is planned and quickly ready for our fast-paced mornings. 5. All school uniforms & husband’s work clothes cleaned & laid out, ready to be worn. Ok, so I would like to get up with my honey in the morning… which is 3:45am. That would mean going to bed at 7 or 8pm. Not going to happen. 9pm is my realistic compromise. My bedtime will be 11:00pm, so I can be up by 7:o0am. 5. Shower/wash-up and PJs on! Don’t hate me … my bedtime is midnight. I function best on 7 hours of sleep, so a 7am wake-up time means a midnight bedtime. I love how your “must do’s” are not all household tasks! I want to be like you. I agree; you’re an inspiration, Kim! 1) Clean up the kitchen. 2) Set out my clothes and the kids’ clothes. 4) Check over to-do list and schedule. Setting out my children’s clothes will be huge because so often they’ll put something on that is not appropriate for that day’s activity, and I have to send them back down to change–this adds time, mess, and stress. I am committing to a bedtime of 11:30 so I can get up at 7:30. My five things will be kitchen cleaned up, Clothes picked out for next day, anything I need for work in a central spot, kids clothes ready (when school starts) and to do list made for next day. I’m committing to get to bed by 9:30pm so I can be up by 5:30am. 3. Breakfast planned and table set. 4. Kitchen cleaned and dishwasher goes on. 5. School area prepared and supplies for next day’s lessons gathered. 1. Main floor of the house picked up. There’s no way I’d be able to have an 8:30 bedtime either. Not only would it be unrealistic for me, but I would never be able to fall asleep at that time. I understand this concept but I would only have 1-1.5 hrs between putting my daughter to bed (2 yrs) and my bedtime. I do not see how I can fit the things I need to do in that time. 4. Everything Together, diaper bag restocked and Set By the Door …ready to walk out the door the next day. Okay, I’m going to put this in writing instead of just thinking about doing it – that whole accountability thing! In bed by 10:00 with lights out by 10:30 – I like to read or do a little Sudoku to unwind. 1. Clothes and SHOES laid out. 5. Breakfast planned and prep started, if possible. I think 10:30 will work. Top 5: lunches made, kitchen sink empty, 15 min tidy of the rest of the house, make sure kids have school bags packed, & I’ve looked over my calendar for the next day. My bedtime will be 10:30. I think this will be reasonable for me I been trying to get back to this time for a while. My goal bedtime will be 10pm. I hate waking up to a mess so maybe I will stick to this! I’m a SAHM, but I always feel better getting up before my daughter and getting a head start on things. Bedtime will be 10:30 to get up by 7:30. May occasionally be later depending on how late hubby gets home. He works late most days so by the time dinner is done, daughter put to bed, and everything else done that needs to be done, we would hardly have anytime to spend together. sorry that should be get up by 6:30. I am going to set my bedtime at 11:00pm, so that I can get up at 7:00am. I am committing to a bedtime of 8:45, I have to be up @ 3:45. I know this only allows for 7 hours but that is the soonest I can get to bed. I am looking forward to the rest of this series as well. Can’t wait to see what’s next!! I’m committing to a 10pm bedtime. I plan to bump it back to 9 – 9:30pm once the kids go back to school, but I need baby steps! My five things are: kitchen cleaned up, dishwasher started, tomorrow’s to-do list/schedule written down, tomorrow’s meals and snacks planned out, all surfaces (counters, tables, floors) in the main living space clear. Whew! This is ambitious, but I need a big change! 1. 1 Load of laundry throught the washer and into the dryer. 2. Kitchen cleaned up and Dishwashers started. 4. To Do List for Next day writtend down and prioritized. 5. Straighten 1st floor of house. I have a horrible time winding down so I start at 7 pm. At 6pm I pick of the house one last time for the day, put the last load of laundry in the drier, and then play a game with my daughter or do a bit of craft work. At 7pm I start reading for 1 hr. At 8 pm I go up to bed. I brush my teeth, get in my pj’s and then get into my bed. I fill out my thankful journal, say my prayers and read my one a day bible. If I stay awake the whole way through my bible reading (often my hubby removes it from my sleeping hands when he comes to bed) and I am still not really tired I might read a magazine for a while but usually I am fast asleep around 8:45 to 9pm. I wake up sometime around 4:30 to 5 am so that gives me 7 1/2 to 8 hrs sleep. I have an infant, so my wake up time is often determined by him, but lately he’s been waking for an early morning feeding around 5 or 6 am. Which means I should have a 10 pm bedtime. Thanks for doing this series! It is an answer to prayer! My new bedtime will be @ 9:30 P.M. with a wake up time of 6 A.M. (sleeping 8 and a half hours…can’t function on just 8 hours, so I thought between 8 and 9 hours would be good because I wanted my wake up time to be for 6 A.M.- about the time daylight comes (at least until the time change). I’m no good waking up when its still dark outside- makes me want to crawl back under the covers! I have to see some daylight in order to wake up and get my body moving! Start time for this is 7:30 P.M. which is right after I feed all the pets (birds, rabbit, dogs, fish) their evening meal and after we’ve had our 6 P.M. supper and dogs walked. Sounds like a plan!!!! 🙂 Better get started on my evening routine..its time right now! I’m committing to a bedtime of 10:30 p.m. to be up by 6:30 a.m.
2. Meal plan for the following day and any items that need prepped ahead. 3. Work out and regular clothes ready to go. 4. Coffee pot filled and timer set. 5. Brita pitcher filled and work out disc in the player. I definitely need help. I’ve really been slacking in the mornings lately. My bedtime is 10:30pm! My little one’s first feeding is currently at 6am, and I’m hoping to transition it to 7:30 so I can wake up at 7am. For now, he and I both go back to sleep and my goal is to get up at 8am. I love the 5 Evening Must-Do’s! I hadn’t thought about that before, but I can already see how much it’s going to help me. Mine are: 1) Lay out clothes, 2) Pick up house, 3) Clean the kitchen, 4) Make a to-do list for the next day, 5) Work on something blog-related. Alright, time to make the commitment! I am committing to a bedtime of 10, but will shoot for 9:30. Thank you Crystal for encouraging us in better utilizing our time in the morning! I’m going to be conservative and set my bed time to 10:30pm so my husband can get up at 6:30am. I’m excited to execute this plan! My bedtime will be 10:00…lights OUT! As a single mom to 4 boys, I need tondo this, since we have to be upnat 6:00. Quick pick-up for whole house. List made for next day. Great series idea. Here is my question….After dinner (and we eat dinner a little later, at like 7 PM or after since he gets home later) is really the only time I get with my husband to cuddle and connect for the day, and normally we watch TV together because it’s basically a hobby we enjoy. So I put off my evening routine until after he goes to bed, because everytime I do it after dinner while he’s up, he’ll say, “please come sit down with me, I missed you all day” or “I just want to spend time with you before I fall asleep.” Which breaks my heart, that I’m doing chores, and it also breaks my heart when he falls asleep while I”m doing them! So if I “could” do it before dinner, that would be great, but that’s impossible because it involves brushing my teeth, doing things in kitchen, and the like. I suppose a few things I could do earlier, but still……even if I get up for like 15-20 min, it disrupts “our time” together, and he starts asking me to just sit down. He hates coming home and seeing me scrambling (first dinner, then evening routine) when he looks forward to just spending an hour with me. So then I’ll do things after he goes to bed, but then it wakes me up more and messes up my sleep schedule. Suggestions? Could you tackle a few chores together? My husband and I used to do the 15 minute post dinner clean before settling into our tv relaxing time… My house was never spotless, but it worked pretty well. We had to make it right after dinner though or no chores would happen! I personally would just have a very simple, basic bedtime tasks – lay out clothes for next day, brush teeth, and that’s about it. Then I’d make the other chores like cleaning up the kitchen to be something to do for the next day, maybe part of your morning routine. When my husband is working almost full time and going to school full time at the same time, we don’t have much time to spend together. Therefore, when there is an evening that he has free time to spend together, I just let all the chores go. The key (for me) is that I make the conscious decision to postpone the chores, so I don’t feel guilty about it. You could consider doing some tasks together. My husband and I often prepare dinner and clean up the kitchen together and chit chat while we’re doing it. Or even sometimes it’s just more like him standing in the kitchen while I prep dinner or vice versa, but we’re still able to talk. I am committing to Bedtime at 10! 5. Prep for next day’s dinner. I don’t always make it to bed by 10, but it’s a great goal and having something like that to shoot for really keeps me honest. Otherwise, it’s all willy-nilly in the evenings. The summer, like everyone is experiencing, is so challenging, as I don’t have a set time to be up. So I let my bedtime goal slide way too often. Even though the school year drives me batty with its demands, I still like the regular routine of it. It really gets me going in the mornings. My friends think I’m a little quirky because I always get things ready for the day the night before- I am particularly devoted to setting the breakfast table no matter what. And since my daughter likes homemade waffles, I have batter ready to go for waffles at least three days a week. I also like to straighten the kitchen, pack lunches, shower, and straighten the house a little in the evenings. I don’t sweat it if something is left undone, but setting the table seems to guide me smoothly through the morning, no matter what else happens. I grew up sitting down to breakfast every day, so that is the one thing that we do every day- and having that table set the night before is so comforting and welcoming the next morning. 1. Kitchen cleaned up; run dishwasher. 2. Pick up toys in living room with help from kids. 3. Lay out clothes for next day. Thank you! I didn’t think it was for me, but have re-thought after reading this post. We’re retired and there is no “schedule”. I really need this discipline. Thanks again for this challenge! Bedtime 11pm on nights when my night shift hubby is off so I can see him and 10pm on the nights when he is at work. 5. Prepare tomorrow’s to-do list. 6. Adding one extra since I only work supplementally. Pack my lunch if I am working the next day. Just reading about the challenge yesterday inspired me to get up at 6 this a.m. Go for a walk, have quiet time, & a cuppa, before i ever turned computer on. Just read for a very short time, & then had breakfast, showered, dressed all before 9:00. Hope to make 6:00 every morning. make sure dishes are done. I love the stay off computer thing! That gets me more often than I care to admit. okay. 9pm, starting time 730pm. I’m committing to an 11:00 bedtime since I need to be up at 7:00 to take the kids to school. Earlier this year I (who could not possibly be less of a morning person) actually somehow manged to get myself into the habit of getting up everday between 4:45 and 5am, working out and showering before I headed to work at 6:40am. I did not miss so much as one weekday before workout session for 10 solid weeks! It was such a wonderful feeling to have all that accomplished before I even sat down at my desk. It was the first domino that got the positive momentum going in a lot of other areas of my life that require discipline and confidence. I really need to get back into that. That’s great that you write and reflect on each day at the day’s end! 3. Bag packed for work. Here goes! In bed at 9:30! My bedtime is 9 pm; I am usually in bed at this time. My first 5 are: Clothes Laid Out; Kitchen Clean up (a problem for me); Lunches Made; Breakfast on the Table; Everything Together and by the Door. Well, I am not a morning person! And I’ve tried this before but having a one year old that wakes up often at night does not help! But I’m willing to try again and again. So my bedtime will TRY to be at 10pm (the latest). Thanks for this! It’s encouraging to see others! It’s great to see so many people commenting and committing to a bedtime routine to make their mornings better. To be up at 6:50am, I’m committing to a 12am bedtime. I put a bedtime of 10pm with planning on getting up between 6 and 6:30 (depending on if I have to leave the house that day or not). 4. Prep for tomorrow nights dinner, does something need to be thawing? I am going to bed at 9:30 and getting up at 5:45 am. I do these things routinely but I need motivation to get back into this routine. I’m allowing myself 2 hrs. to complete these so I can nurse and snuggle with my baby girl when she wakes up without losing out on precious sleep. 1) kitchen cleaned/dishwasher started- hate having dirty dishes to run in the am! I am going to bed at 10:00pm. pick up the house, get items together for breakfast, start the dishwasher, shower, take items out of the freezer that I need for dinner the next night. Thanks for this challenge, I know it will help me! Fill water bottles and leave snacks ready for next day, leave diaper bag ready. Go to bed by 10. 5. (Not starting this one for a few weeks tho) Pack school lunch for my 2nd grader. Looking forward to getting my morning routine working for me a little better! I tend to get caught up in social media at night so sticking to a bed time is a good challenge for me. My goal is to be able to, perhaps just maybe, fit in a workout in the AM before everyone else is up and moving. Also, I don’t normally get 8 hours sleep so I’m pondering whether I need to stick with that…. Okay, I can do this! To bed at 10! 2. Make sure everyone’s clothes for the next day is ready to go. 3. Know what will be for breakfast, and do as much prep (if necessary) as possible. 4. Backpacks ready to go, notes signed, etc. 5. 10 minute pick up around the house. I’m grateful for the extra boost to go to bed on time, which is 10. Looks like I’ll be starting at 9:15. I agree with someone else who noted how encouraging it is to read others lists. I start back to work tomorrow and so this is a timely challenge. I am married with no kids yet, hopefully soon, 😉 I guess because of this my bedtime is relatively easy to keep. I NEED to be in bed by 10:30 in order for me to be a happy, healthy person, so this is nothing new. My 5 things are going to be new things that I don’t already do (like cleaning up the kitchen, or prepping lunches). 1. prepare clothes including ironing (I like someone’s idea of doing this for the whole week on Sunday!) 2. Fill water bottles. 3. Gather materials and pack work bag. 4. Journal about my day. 5. pray with my husband. In bed one hour after my little guy goes to bed. I have to admit, after reading a bunch of the replies it makes it very hard to not want to add more to the list that I didnt put on there that would be so much more helpful. Hoping we add to this list as we go along. 4.Know what I’m making for dinner the next day and write any last minute items I might need on to-do list. 5.Tidy bathroom after washing face/brushing teeth (5 people + 1 bathroom = messy bathroom every day!). Let’s hope I can stick to this. I’m setting by bedtime for 10:30. 10:30 Bedtime (this will be hard – I’m such a night owl) so I can get up at 6:30. Right now my husband is off with a broken foot, so things are more relaxed around here. I’m committing to a bedtime of 11pm, with a wake-up of 7am. That’s 1/2 an hour before my kids come out of their rooms. It will become 10pm and 6am when we get back into the swing of things! What great timing! I have been working on sticking to a bedtime and this – “This is the time that you must be in your PJs, have everything finished for the night, and be in bed. No ifs, ands, or buts. I’m your new drill sergeant and you must do what I say, okay? ;)” – somehow makes me feel like I need to stick to it. I would like to work up to a 5:15 AM wakeup time to have plenty of time for getting ready, a good breakfast, and reading my Bible so I can leave at 6:30. At the moment I am doing okay with 5:30 but I am not getting to bed until well after 10 (or 11), but my goal is 8:30 because this allows me time to read and lights out by 9. 1. Make my lunch/snacks for the next day and have anything I need to take ready to go. 2. Shower/dry hair – this makes my life easier in the morning because my unruly hair will behave so nicely this way, saving a mountain of time. 3. Lay out my clothes – otherwise I will be hemming and hawing over my choices the next morning. 4. Have a cup of tea – this has really made a difference in my sleep. 5. Read or crochet after going to bed but before going to sleep. A crochet magazine works best because it is easier to stop after a while, instead of getting caught up in a plot, and there is just nothing stressful or agitating about a crochet pattern! An afternoon Must-Do that I have found will be very important that affects my rest, and so my morning, is having all of my school stuff and lessons ready for the next day so that I don’t have to stress over it. Last year I would lay there all night thinking things like, “Did I remember to set out the sight word cards for the English lesson?” If I take care of it early (and know that I will be at school most of an hour early), that stress goes away. So since it is 8:31 and I have done all on my list but the tea, and even though I would love to stay up and finish this movie, I guess I would have absolutely no excuse to not be in bed on time this evening! I am committed to going to sleep by 9:30, I get up at 6:00 but I need that extra 1/2 hour to wind down or I’ll never get to sleep. Bedtime will be @ 11 which is early for me!! I get up at 5am, which means I should be in bed between 8-9pm, but that just ain’t gonna happen as my kids are in bed between 7-8pm. I’m going to shoot for 10pm at the absolute latest with the goal of getting in bed before then. I set my bed time for 11:30. I can’t promise any earlier then that – so I figured I better go with an honest time. Even thought that only allows me 6 1/2 to 7 hours. But lately I have been staying up much later then that. I will work to slowly bring it to an earlier time as we get the family back into the school schedule and the structure returns to our schedule. 1. Take out the garbage – all of it, empty every bin and bring it out. 3. Load the Washing Machine so that I can run it immediately after morning showers. 4. Pick up the Living room. 5. Wipe down the Kitchen Surfaces (counter top, stove, etc). These are a good start to get me in the practice and habit – normally I am dead tired at night and barely find my way up stairs. Here is to a better and brighter morning! In order to complete these and meet my bed time – I better get started – NOW! My bedtime is 11:00 and I’ll get up at 8:00. I have to have a lot of rest due to an autoimmune disease so this should be a good amount. 3. Tidy the living room and powder room. 4. Set the table for the kids breakfast. 5. Clean off the stairs and entryway. I will try to be up by 5:30, but not until next week until when school starts back. Thanks for starting this series! 4) quick pick-up of living room area. 5) layout all homeschool materials for next day. Oops! I am already 20minutes late to bed. Thanks again for this awesome challenge! Bedtime goal of 11pm, which means being in down in bed by 10 pm so I can wind down and fall asleep while watching netflix, awful habit I know, but one thing at a time. The wake up goal would then be around 7 when hubby gets up for work. Going to work my way back towards 10:00 for bedtime. 5. Everything together for the next day ready. Let’s hope this works out! I stopped while reading this to get a few things in the house in order before continuing to catch up on your blog! Thanks for the motivation! I get up at 5:30 and check the computer quickly, empty the dishwasher, make my bed and straighten up anything not straightened the night before, then I pack the kids lunches if needed and get breakfast ready to go. That way when I get them up at 6:45 I’m not rushing around trying to do all those things in 45 minutes and get them up and ready for school. To be able to get up at 5:30 I need to be in bed by 10:30 or 11 at the latest. But if I go to bed any earlier than 10 I tend to be more tired than rested the next morning. I’m in… I was just talking to the hubs about finding a routine because I am NOT a morning person… but I need to be this semester with 2 jobs, college, home and 2 kids + extracurriculars. And college starts on Monday… yikes!! I need to wake up by 615 so I need to be in bed by 115. And that’s a total stretch for me but I can’t afford to stay up later because I have no afternoon nap opportunity!! which means I need to start my evening routine at 11… get cardio done by 12, showered by 1230, in bed by 115… I definitely can do this. THANK YOU for this series!! BONUS: If I had to start a load of clothes, throw them in the dryer right as I head to bed. I am committing to 10:00 bedtime. I have always been pretty disciplined in getting things done the night before, but I have decided to stick to my 5 most important and let the others go so I can get in bed by 10. My five are to have the kitchen cleaned up, lunches packed, thaw meat for the next day, do a quick main level pick-up, and make a basic plan for the next day. Okay my bed time is 10:30pm. 1. Dishes done or in dishwasher. 5. Check To Do List for the next day & have everything prepared. I have some serious night owl habits. (borderline vampire hours) I want to be more productive by getting an early start on my days – so this series is perfect for me. Thank you for doing this. I will start with a commitment to get to bed by 11 pm. That is still kind of late, but it will be a realistic start for me. 9:30 pm —Bedtime is 2 minutes away!!! I’m posting in hopes it will keep me committed. Sadly I just finished reading this after my newly allotted bedtime, so tomorrow this all starts. I’m good about doing the last one most nights already, but its doesn’t hurt to put it in writing to keep me on track. I fall behind on laundry when I get lazy with this. Bedtime is at 10pm!! Eek! 2. Pick up the kitchen-counters and floors. 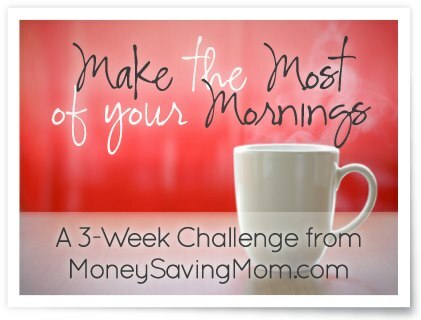 So excited to start MoneySavingMom’s 3-Week Challenge. I have to laugh though. I am totally positive that my kiddos know I’m doing this and are already challenging it. 🙂 They have both been up 1-2 hours earlier than normal this week. Really?! LOL. 1. Determine a bedtime. With a 2.5-year old and 1-year old in the house, I really value my alone time in the mornings before they wake up. Now with a new routine of going to the Y every weekday morning (with the kiddos), I like to have as much of my household stuff done as possible before they wake up. In order for that to happen, I like to wake up at 5:00am. I know MSM suggested 8-9 hours of sleep, but getting 7 is an improvement for me, so I’m going to start there. Bedtime is 10:00pm, and I’ve totally botched that tonight. I was reading Crystal’s post and took the wrong medicine. I took my AM medicine instead of my PM and now I’m wide awake. Dang! Tomorrow night is 10:00 for sure though! 2. Top 5 Evening Must Do’s. – Pack the Diaper Bag. Now that we are actually leaving the house every morning to go the Y to exercise, having the bag ready with diapers, extra clothes and snacks will definitely cut back on the “rushing at the last minute” stress. – Stick to a Bed Time Routine for Kiddos. Unfortunately we have been pretty loosey goosey with bedtimes. To have them bathed, in PJs, teeth brushed, prayer time and snuggled in bed for story time by 8:45pm is our new goal, which means I need to start at 8:00pm every night. I get up at 6, so I need to be in bed by 10:30, 10 if I want to read. Because my kids aren’t in bed til around 9pm (we’ve tried earlier- it just doesn’t work) and I like to have that hour with my husband, I will do these 5 things right after dinner. 2. make to do list. 4. 15 min general pick up around the house. 5. workout clothes and regular clothes laid out. 10 pm! Going to start going to bed at 10 pm and hoping my son starts sleeping through the night!! I would like to be up at 7:30. That means I need a bedtime of 11:30. I actually cannot remember the last time I went to bed at 11:30. I cosleep with my baby, and nurse her to sleep while reading stuff on my laptop. Then, I stay up way to late on the computer. Like this! I am having a hard time deciding on five things. 4. Put baby to bed, but listen to something instead of surfing internet. I do not know what else to add. When school starts, I will likely have to add getting school materials ready. Hopefully we will be disciplined to put our things away as we go through the day, though. And hopefully I will have all the kids’ assignments planned out and written down on a weekly basis. Haha! I think we will start at 9:00 at the very latest, with the kitchen clean up having been started right after dinner. The children’s bedtime is 9:30. We have been staying up way too late this summer, though. Especially the past two weeks with the Olympics on TV. We enjoyed the Olympics so much, but it really shifted our schedule in a bad way! Bedtime will be 10:00 pm so that I can workout in the morning. I’m just now catching up on Facebook posts I’ve missed. (It’s almost 1AM…blech!) I hope it’s not too late to join the plan?! I typically wake up at 4:30AM during the school year. Your Morning Routine Plan couldn’t have happened at a more perfect time!! I need to get back on a better schedule. School in my area begins in less than 2 weeks. So my husband likes to call me Supermom, kind but not true. We (I) am in need of help and the first way our life is going to improve is by realizing that life is messy! If it wasn’t it wouldn’t be as much fun. And I like to think we have a lot of fun at our house 🙂 Second improvement will come when I decided to go to bed earlier. I know I am not productive at night and instead of wasting time, I will now have a bedtime of 10:00. (Except Thursdays I work till midnight) I will just need a nap on Friday after class. Finally after analyzing what needs to be done at night I have realized I need to delagate. I have to be okay with realizing that I can’t do it all on my own. So in the spirit of changing our schedules (with a goal of more time together in the end) my whole family sat down tonight and wrote out a Top 5 list for night time. I am hoping it will help all of us have smoother transitions from night to day 🙂 We even wrote one for our 2 year old! We are excited to try it out tomorrow night! Bedtime for me will be 11.30 at the latest. I’m starting a day late, but I’m excited about this series. I’m going to hopefully get my two teenagers excited about doing this as well. I’m committing to a 10:00 bedtime so that I can get up at 6am. I’m hoping this gives me enough time in the morning before the baby gets up. My 5 to-dos are finished up any dishes,15 min pickup of downstairs, school stuff ready, diaper bag ready and go over schedule for next day. I’m very excited to get this challenge underway, hoping I can stick to the getting up at 6 every morning!!!!! Up by 5:30 and in bed by 9:30. Although I did not do the calculating thing I did get a jump start on my morning today last night, and it is always a life saver!!! I am in my third trimester of pregnancy right now due next week! : ) So I’ve had to reduce my speed greatly from going 90 mph to like 40 mph!! This pregnancy has been so different from my other two, I have been very tired. I usually would get things done the evening before but slacked off a great deal the past 5 months (poor hubby) or so. However, this has given me a “burst” of energy to get back into routine, and with our youngest starting school next week the same week I have the baby I really need to get back on track! I guess my bed time would be 0900 am however that just never seems to happen for me, I get the most done in the early mornings and at late night. -Make sure hubby has clean work clothes hung out (we use a hook on the wall by our bedroom door, works pretty good for us, gotta love hooks they sure help save space!). -Make hubby’s lunch for next day. -Plan breakfast(s) for the next morning.. This actually applies to the kid(s) and my husband separately. I know my kids will only eat certain things in the morning, some eat lighter than others especially my daughter, so I try and keep breakfast light for hubby (he likes cold and sweet stuff in the summer, and hot and savory in the winter along with routine morning coffee to keep warm!) since he leaves so early (5 am early) in the mornings, and the kids are usually satisfied with hot cereal (oatmeal), cold cereal, or pancakes. I decided yesterday that I would start this crockpot breakfast thing and see if it really helped, tried it last night and what a great idea and how come I haven’t tried to cook breakfast in the crockpot before??? Such a time saver and I feel even more productive getting it done while I sleep! -To do list for next morning (no number on this yet, but I have taken your advice and tried to keep the number 5 or lower). For me, this only applies to the “need to” category, everything else (in the “want to” category), I just work in when I can, and right now, when I feel like it. This one has been a huge challenge for me for months now. Once I hit my second trimester me and my husband were bickering a lot because he had gotten used to me doing so much, and then it just stopped suddenly. The kitchen is one of the busiest rooms in our home, I could live in my kitchen, I love food, and I love cooking. But the kitchen was becoming the center of our bickering, we adjusted and that moment passed of course. As a way to really clear the tension in this area for good I decided to add “cleaning the kitchen” to this list. It helps so much, and I wake up in a much better mood seeing a nice clean kitchen with delicious aromas coming from the crockpot first thing in the morning. Can’t wait for the rest of the challenge! I am committed for the next 3 weeks to be in bed by 10 so I can be up by 6 a.m. My top 5 are: 1) Clothes laid out, 2) Kitchen cleaned up, 3) lunches made, 4) Breakfast set out, 5) everything at the back door. I went beyond this though and set up a nightly routine for my kids since we were kind of lax on this during the summer and there’s will be going to bed at 8 and getting up at 6:30 and there top 5 will be 1) clothes laid out, 2) pick-up house for 15 minutes, 3) everything together at the back door, 4) shower, brush teeth, pj’s on, 5) Read book for 15 minutes each. My children are 5 & 7 so most of these things with a little help from mom and dad they can do on there own. I am so excited about getting back into a routine for the school year, especially since I will start substitute teaching this year in school as well. My goal will be to be in bed by 10, I’m up by 5 or 5:30, but I just can’t do any earlier…. 1. set out clothes for next day. I love this series. For the past 2 months I’ve been getting up at 5am – nearly 3 hours before the rest of the family and it has been wonderful! I don’t really aim to get a bunch of stuff done, just some quiet, me time. I spend time with the Lord and then spend quiet time on the computer – mostly so that I can focus on the family for the rest of the day. I rarely check the computer throughout the day anymore, I just look forward to my 2-3 hours of uninterrupted time each morning. It is motivation to wake up each morning too. My determined bed time is 10:30 and I get up at 5am. I lay out my clothes the night before and shower or bathe the evening before. Lately my schedule is totally out of whack due to having a 3 week old! He loves to stay up all night so I have had some odd “bedtimes,” 2 am, 4 am, etc. So I would like to have a bedtime of 11 pm, but for now I am going to set a reasonable goal of midnight and work on that first. But I will start my “bedtime routine” at 11. My husband is a teacher so every single routine I work to establish during the year goes right out the door at the end of June. I”m going to miss him like crazy in September, but I am looking forward to having some routines again. One thing I love about getting ready the night before is that the kids sleep through it even if I make a bit of noise. If I do dishes and run around getting things done at 5 am then my kids will wake up and quickly derail my morning plans and often make my husband scramble to get to work on time. At 9 pm they’re too tired to wake up for a little noise! I love this series! I need the mornings to go smoother for sure! I picked 11:30. That’s realistic for me and my family. Ok I’m in….this will be tough but good for me. I may struggle a little getting up on time cuz I have a two month old who is still waking up one to two times. My goal bedtime is 11pm to be up by 7am. I am working for a 10pm bedtime. I am excited to complete this challenge! I have to get up at 5:30, which means my bedtime would be between 8:30-9:30. But I know that two days a week I won’t get home for the day until 8. So I set my bedtime between 9:30-10:00. 4. Put folded laundry away. 5. To Do list for the next day. 2. No TV/music once I arrive home so I can start winding down for a better nights’ sleep. 5. “To Do List” for the following made completed. I’m setting a bedtime of 10 and my tasks will be Clean Kitchen, prepare/plan breakfast, 15 minute house pick up and 1 load of laundry. Thanks for doing this….it is exactly what I needed for the school year starting up in a few weeks. 1.) Cloths laid out for next day. I am trying to find to make a daily or weekly to do list for household chores for me and the family. I want a daily to-do list, but I have trouble sticking with it. Wouldn’t you know it, I had this all planned out and determined to begin last night and then came down with a head cold that kept me up most of the night. Le sigh. Ah well, guess I’ll be starting tonight instead! The plan is to go to bed at 11, so that I can be asleep by 11:30. I read somewhere that it takes the average person 17 minutes to fall asleep, so if that is the case I should be asleep by 11:30 no problem. I usually do some reading and my personal devotions before bed, too. I’m more alert at that time of day plus it helps me wind down for sleeping. That is and will continue to be included in my night routine. Its kind of a given! Thanks for this challenge, I’m excited to conquer my mornings! I am a grad student, and quite the night owl, so I am committing to go to bed at midnight, this way I can get up at 8. This means at 11 PM I am going to start my evening Must Do’s: Pack my school bag, Lay out my clothing, Do a 15-20 minute house clean up, Stretch, and pack my lunch. 2. Boys stuff together (including baby bag) for tomorrow – sometime we have play date, other times it is getting ready for school. I just have to get it together so I’m not insane in the morning. I set my bedtime for 10pm. Five bedtime goals: create to do list for tomorrow, 15 min tidy house, clothes laid out for tomorrow, get ready for bed, read Bible and pray with Hubby. My bedtime is 10:00 p.m. Oh, this is going to be a struggle! I might really need your drill sergeant help, Crystal! I’m shooting for a 9:30 bedtime which I have no idea how I’m going to do. Hopefully I can get up early so I can get a workout in so I do not have to do it on my lunch break! Then I can leave 30 minutes early from work or get some wiggle room in the morning. My bed time is 10:30, and my 5 tasks are have clothes ready for me and kids, have all lunches packed, have my Frapee made and in the fridge, know what appointments I have and when I need to be at them, have breakfast prepped as far as possible (for everyone). I really need to get my act together so I’m in! For now bedtime will be 10 but hope to get it to 9:30. 3. 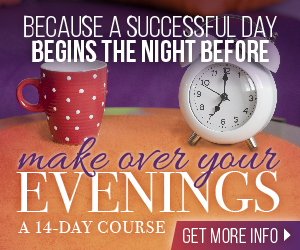 Look over homeschool lessons for the next day. 5. Make a to-do list. How I wish I could do this … I’ll give it my best shot, but I have a 6-month old who is currently up 4 times a night. There’s no way I can do 8 solid hours of sleep a night, but I’ll do my best with the rest of it. No reason I can’t have my “top 5” done every night anyway. Wish me luck! I am a day late on this but here are my five! I am committing to a 10:30 bedtime. 2. Sweep kitchen and dining room. 4. Update white board for tomorrow. 5. Stock diaper bag. I have been caught not doing this too many times! except that might be hard some nights because I am taking to college courses at night to finish my teaching degree. I got my husband on board!! 3. Wash face, moisturize, brush teeth, braces rubber bands on, etc. Up by 6, so in bed by 10? Yeah, it’s not likely, but I’ll aim for 9:30, then maybe I’ll actually be in bed by 10:30…I’m not very good at this part!! I have a NOT to do item: do NOT get on the computer or internet after dinner! I ALWAYS stay way too long on it & totally blow my bedtime schedule. Staying off of it also allows me to mentally unwind and lets me get to sleep easier. I used to iron clothes each night for the next day (I need to add that it’s just me that I have to iron for), but I have found that I’m so tired each night that it’s not the best solution. So I have started do any needed ironing for the week on Sunday afternoons/evenings well before bedtime. And it takes less time overall: I just have to get the ironing board out & the iron going once a week instead of potentially 5 times. I really should be in bed by 10:30 because I read before going to sleep (I have a really hard time sleeping without reading), and I usually have a hard time pulling the book away before 1/2 hour passes. 1) Make myself start this process by 9:30! 2) Put the next day’s outfit aside. I have to get to bed by 9:30 and asleep by 10:30 to get my 8 hours. I’m committing to a bedtime of 10pm. I normally get up between 6 and 6:30. I’m only doing 3 things in the evening- that will be plenty for now. My bedtime will be 10pm and getting up at 6am (until school starts, then up at 5am). Start evening Top 5 Evening Must Do’s at 9pm. I have committed to a 9:30 bedtime. My husband would like to go to bed at 9, and I would like to go to bed at 10, so this is a good compromise. And my five things to do in the evening are: clean up dinner dishes, straighten living room, put away laundry, sweep floor, wipe off kitchen table. I don’t really need to have anything ready for in the morning because I’m a SAHM and my only child is 1. We usually don’t go anywhere first thing in the morning. But, I do like waking up to a neat house. Thank you Crystal for having this forum for us to clarify our goals and schedules. I already do 3 1/2 of these, so I’m really only adding 5. Some could probably be combined, but this is what makes sense for me right now. I love having a “start time” for these. I think that will make all the difference! Go momma, I am there with you, my kids are 4, 8, and 10. They start back to school next Monday and I am not looking forward to those 6am wakeup calls. Better late than never I guess. 🙂 My bedtime will be 10:00, so I can be up at 6:00 at the latest. I’m going to have a hard time starting my evening routine at 9, but I really want to give that time a few weeks’ chance. After the kids are in bed, I usually want a lot of chill time with my husband and/or veg. time (where I am not productive at all for a bit), but once I start vegging, I lose all motivation, so that habit needs to go. Thank you, Crystal, for being a great motivator. It is only a week late but I committed myself today that I am marching right along behind you. My new bed time is 10pm, which is better than my 11-12 o’clock finally drag my body to drop into bed. My goal is to work my bed time back to 9pm and start earlier, but I am by no means a morning person. I need a little structure to my day, not my norm, for not only for myself but for my children. Since it’s just me and my daughter, we sat down together and decided that 9pm would be our bedtime. We have to get up by 6:30am on school days, so we are going to stick with that as our daily wake-up time too. My daughter likes that she has been included in this ‘Bedtime To Do List’. And since it’s just me and her, I feel that we can both do it together and it will set a good example for her at the same time. My wakeup time is 6am so I’m committing to be in the bed by 9pm or 10pm. I’m setting a bedtime of 11pm, so I can be up by 7am. As a full time student, full time worker and mother of 4…the earliest I can commit to go to bed is 11 PM. Sticking to it will be a challenge but I think it will be helpful. My five things are to be making lunches, prepping breakfast, setting all of the clothes aside, putting all my stuff for the next day by the door and the 15-minute quick clean up. So far this website has transformed me into a much more organized person needless to say its my favorite! You can do it! We’re cheering you on! i know this thread is a couple years old, but i would love to start this routine. my problem is finding the energy at night to get all these chores done. i know its something that needs to be done so my mornings go smoother, but i really poop out at night. This is a great idea. I know to do some of this but have a habit of falling off of sticking to it. I must be more consistent to help myself have a better next day. Great tips!